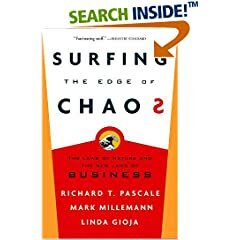 Surfing the Edge of Chaos is my latest discovery from the library. I’ve only read two chapters but so far I am really loving this book. The second chapter title is worth the price of admission – “Equilibrium is Death.” This book looks at evolution theory and applies it to organizations. Now I am a pastor and I am in no way consenting to darwinian teachings for the origins of life. That being said, the applications that the authors have made based on those teachings are fascinating. Particularly the concept that Equilibrium is Death. Wow, how many times have I heard in church that we should strive for equilibrium? A lot. I’ve seen it on the cover of programs, sermon titles, all over the place. And the thought that the church is trying to communicate is that Balance is important. So true. But when an organism or organiztion reaches perfect equilibrium it’s dead. The authors of this book are trying to get the readers to see that Organizations need to be constantly exploring risky ventures. They need to be trying new things, going after new ideas and taking risks or else they will die. How many churches refuse to change because, “We’ve never done it that way before”? Our church has gone through quite an emotional and painful journey over the past 15 or so years. I haven’t been there for all of them but I wonder if the level of pain was not high enough to try to change? I wonder what would have happened if we had sold our building sooner? What would have happened if we would have developed our current model of ministry sooner? What would have happened if we had developed an internet presence sooner? All of these are speculative, but they all require change and risk and I think we were pretty risk averse, because we were trying to maintain equilibrium. We were just trying to hold on. Jesus didn’t call us to just hold on. Jesus told us to charge the gates of hell. And if we are going to charge the gates of hell then we are going to have to be willing to let go of the things that are anchoring us to the present and run towards the future that God has in store for us. Wow I think I’m ready to testify! Leaders are to a social system what a properly shaped lens is to light. They focus intention and do so for better or for worse. If Adaptive intention is required, the social system must be disturbed in a profound and prolonged fashion. Magnifying a threat or utilizing organizational devices to propagate “genetic diversity” then becomes important. Adaptive leaders don’t move on an issue too quickly or reach for a quick fix. Rather (taking actions quite to opposite of social engineering), they emphasize mobilizing followers deep within the ranks to help find the way forward. This is achieved by (1)communicate in the urgency of the adaptive challenge (i.e. the threat of death), (2) Establishing a broad understanding of the circumstances creating the problem, to clarify why traditional solutions won’t work (i.e. sustaining disequilibrium), and (3) holding the stress in play until guerrilla leaders come forward with solutions (i.e. making room for genetic diversity). We are seeing the rise of Genetic Diversity and Guerilla Leaders coming forward in several areas. Particularly with the launch Ethos. My prayer is that we can continue to see leaders rise up to the challenge and bring new fresh ideas on how we can be a thriving, innovative church.